I know who did it… do you? It is New Year’s Eve, 1946. In one hour, Guy Lombardo and his Royal Canadians big band will play Auld Lang Syne, and champagne corks will pop, celebrating the coming of 1947. A wealthy financier has invited friends, business partners, and loved ones to a fabulous dinner party… to inform them that he’s cutting all of them out of his will. And before the first tick of the clock on the New Year, the financier will be dead. The question is… whodunit? Don’t worry, the murderer will be found. All the clues are there, waiting to be uncovered. And, just before revealing the identity of the murderer, our hero will turn to the camera and say to all of us at home, “I know who did it. Do you?” Welcome to The Adventures of Ellery Queen. One of the most traditional “whodunits” in television history, with wonderful performances, great scripts, truly excellent mysteries, and all the clues laying out in front of the viewer, if they’re clever enough to spot them. The year is actually 1975, and NBC has asked Richard Levinson and William Link, the creators of Columbo, to do justice to a television adaptation of one of the greatest and longest lasting series of mysteries ever written. And amazingly enough, they pretty much got it spot on. 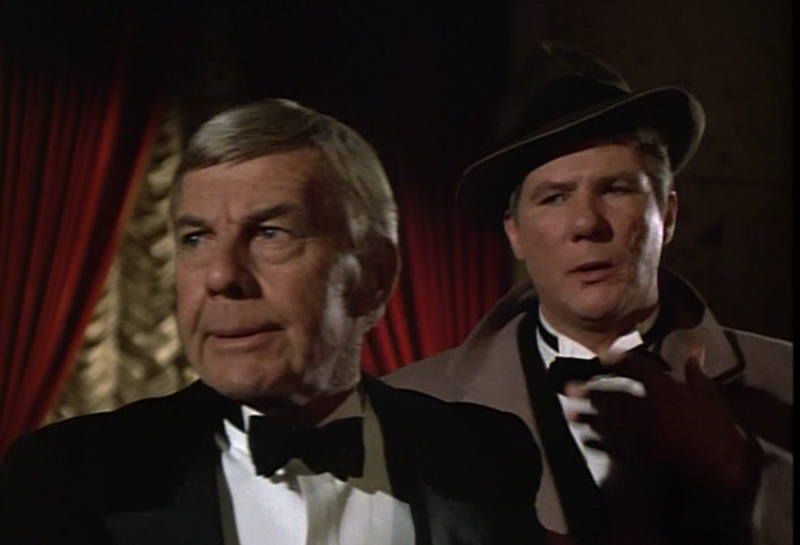 “Ellery Queen” has been a multi-faceted franchise from its beginning. The name refers not only to the character in the books, movies, radio series, and (in our case) the television show, but it also refers to the pen name of the two cousins, Fredric Dannay and Manfred Bennington Lee, who originally came up with the character and wrote the early stories. (It was actually one of the best marketing tools of the era, having the “author” and the character of the book being one and the same. Very easy for readers to remember.) “Ellery Queen” became the best known American fictional detective of the mid-20th century, and the mystery novels led to many successful iterations, including Ellery Queen’s Mystery Magazine, which is still being published today. But primarily, we’re concerned with the television series, and also the radio series that most influenced it. First of all, the mysteries of Ellery Queen were always “Closed” mysteries. In other words, all the clues in the mysteries were discovered by Ellery at the same time as they were by the reader/listener/viewer. 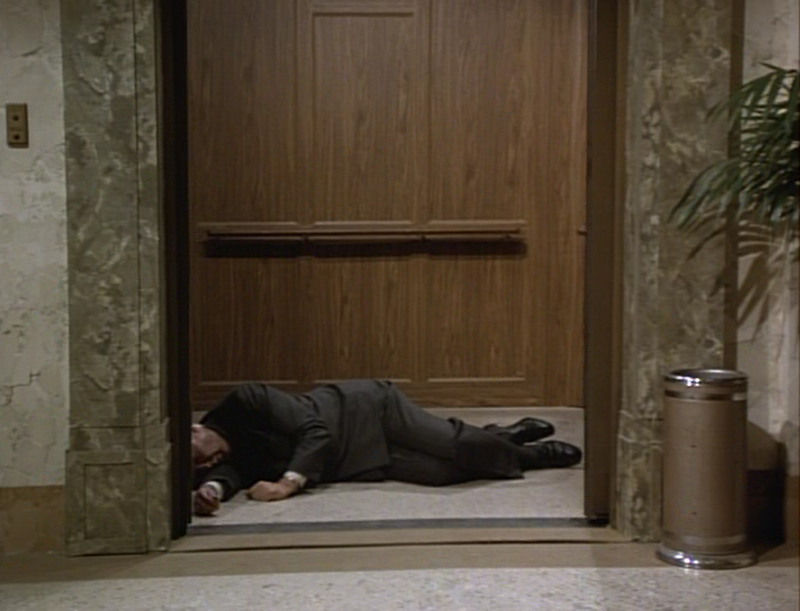 This is the same type of presentation used in, for example, Murder, She Wrote, as opposed to an “Open” mystery, such as Colombo, where the viewer knows the murderer, and the fun is in seeing how our hero will be able to prove their guilt. “Closed” mysteries have the advantage of having the audience able to completely “play along” with the detective, and thereby try to solve the mystery at home… or in the case of the 1940’s radio series, to have Ellery realize “whodunit”, and then a radio announcer would interrupt the dramatization and a panel of Hollywood guest stars would take a crack at solving the murder (playing the part of the audience) before Ellery would return to dramatize the actual solution. The 1975 series on NBC was a faithful re-creation of this idea, set distinctly in the late 1940’s, without the “star” interruption. 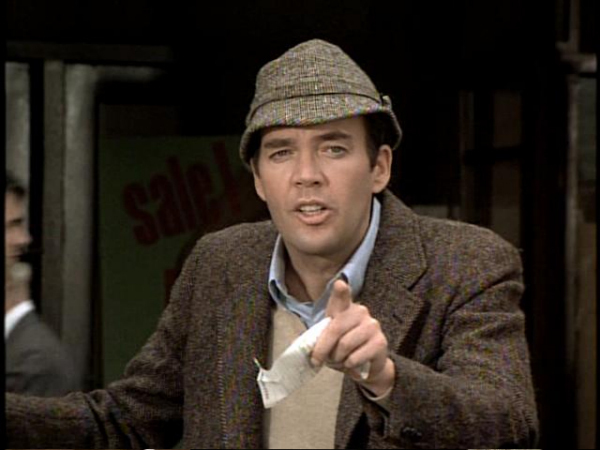 Each hour would show Ellery (played by Jim Hutton) discovering clues and red herrings, until near the end of the episode. After discovering the final, vital piece of information, Ellery would turn and speak directly to the viewers at home, telling them all, “I know who did it… do you?” And then would follow the solution. Ellery was joined during the mysteries by his father, Inspector Richard Queen (David Wayne) of the NY Police Department, and the Inspector’s right-hand man, Sgt. Veile (Tom Reese). These two portrayals are the definitive screen versions of the characters, with the possible exception of the fact that Inspector Queen, in the written versions, has a significant mustache… but the performances of Wayne and Reese are, again, spot on. Two other characters were created for the television series (although they never appeared together). Simon Brimmer (John Hillerman) was a competitive foil, an urbane radio host who tried to solve cases before Ellery did, usually coming to a wrong solution just before Ellery provided the right one. Newspaper reporter Frank Flannagan (Ken Swofford) spoke like he was writing headlines with every sentence, and always tried to get the “scoop” on who “Junior” (his nickname for Ellery) was about to find guilty. And Ellery did find the guilty party, every time. He was the best, after all, even though at times he’d be so absent-minded that he’d forget his reading glasses were on his head. Or so naive that he didn’t realize the femme fatale was actually trying to seduce him, when he was just incredibly focused on the crime. Ellery had his foibles (many of which infuriated his father), but when it came to putting together the clues, he was a genius. In fact, to solve some of these mysteries, being a genius was a prerequisite. The mysteries themselves were detailed, and usually rather tricky. In fact, sometimes, the writers almost outsmarted themselves. In trying to make sure that they didn’t “dumb down” the clues for television, their choices actually led to the mystery solutions being perhaps too difficult for the average audience to deduce. For viewers who loved to be challenged, it was the perfect show. Unfortunately, it aired during an era when the most popular shows were, shall we say, a bit less challenging. 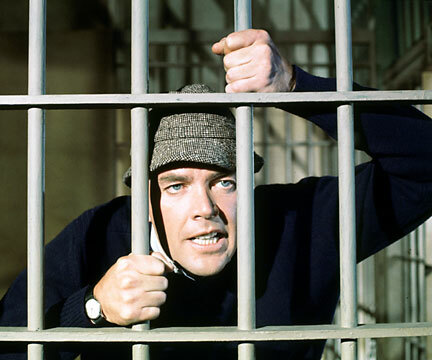 Ellery Queen — Criminally Intelligent? The show originally aired as a 2-hour pilot as part of the NBC Sunday Mystery Movie series, entitled Too Many Suspects. 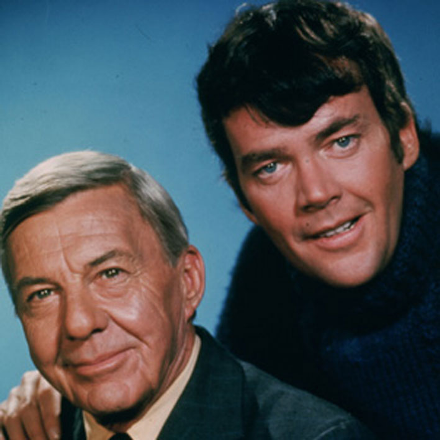 The series itself began in the Fall of 1975, and ran for 22 hour-long episodes. Airing originally on Thursday nights, the show was moved to Sundays late in its run. Ellery Queen had the distinction, at the time, of being the highest rated regular show ever canceled by NBC, likely due to the fact that it was somewhat expensive to make as a period piece, and also because of the significant intellectual investment it took for the average viewer. 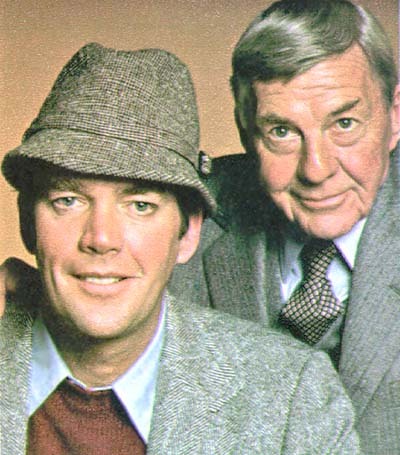 Top shows at the time included Happy Days and Laverne and Shirley, a far cry from the complicated and involved plots (and plot twists) of Ellery Queen. The show is fondly remembered however, and will finally be available on DVD in September 2010. Part of this fondness is due to repeated airings of the show on the A&E network as part of their morning mystery package for many years, and, if you happen to have a local station affiliated with the RetroTV network (some stations carry it as part of their secondary digital signal), the show is part of their rotating lineup. There’s also a YouTube video of the “teaser” of one of the episodes (usually cut off in the syndicated airings for more commercials) that is extremely reminiscent of the radio shows, detailing the suspects for that mystery and inviting the audience to figure out “whodunit”. And if you really want to try your hand at deduction while waiting for the DVD release, here’s some of the original 1940’s radio shows, available for free streaming, so you can truly match wits with the masterful Ellery Queen. JIM HUTTON (Ellery Queen) was a contract player at MGM, and his first roles of note were a series of 4 movies (including Where the Boys Are) where he was paired romantically onscreen with Paula Prentiss, apparently because “they were the tallest contract players there”. He also appeared in two John Wayne movies (The Green Berets and Hellfighters) before moving into television. A few years after Ellery Queen, Hutton died of liver cancer. His son, Timothy, is an Oscar winner for Ordinary People and is now starring on the TV series Leverage. DAVID WAYNE (Inspector Richard Queen) won the first Tony award ever given for acting in 1947 for his role as the leprechaun in the original Broadway production of “Finian’s Rainbow“. He won another for The Teahouse of the August Moon. On screen, he appeared in the original movie version of The Andromeda Strain and portrayed the villainous Mad Hatter in the Batman TV series. In addition to many TV guest roles, including a multiple episode stint on Dallas, he played Dr. Weatherby on three seasons of the CBS comedy House Calls. He died in 1995. TOM REESE (Sgt. Veile) had a long career before Ellery Queen, first appearing on television in the cult favorite Johnny Staccato in 1959. He was best known for appearances in numerous TV and movie westerns, including episodes of Bonanza, Have Gun, Will Travel, Rawhide, The Virginian, and Gunsmoke. Later, he appeared in shows as varied as Chico and the Man, The A-Team, and Moonlighting. His last guest shot was once again in a western, Paradise, in 1989. JOHN HILLERMAN (Simon Brimmer) is best known for playing the role of Higgins, the friend and foil of Thomas Magnum in the long running series Magnum, P.I., for which Hillerman won an Emmy. He also played a recurring character on the comedy One Day at a Time, and later appeared as a regular on Valerie, a revamp of The Hogan Family. He is now retired, having moved back to his home state of Texas. The somewhat British accent of both Simon Brimmer and Higgins was NOT his natural speaking voice! KEN SWOFFORD (Frank Flanagan) is almost the definition of “television character actor”, having played supporting parts in numerous TV series (actually, almost 100 different series and TV movies, by one count). Notable series roles include a season on the series Fame, and regular or recurring roles on The Eddie Capra Mysteries, Murder, She Wrote, Dynasty, The Rockford Files, and Gunsmoke. He also did some voice-over work in recent years before his retirement from acting. RICHARD LEVINSON and WILLIAM LINK (Producers) were THE mystery team in Hollywood and TV in the ’70’s and ’80’s, having written or produced shows like Columbo (for which they won two Emmys), Banacek, McCloud, Mannix, The Cosby Mysteries, Murder, She Wrote, and Probe. They also produced and wrote the TV movies Rehearsal for Murder, Murder by Natural Causes, and Guilty Conscience, ALL of which won the Edgar Allen Poe award for Best Mystery TV Movie in their respective years. They were also nominated for a Tony award for Best Book of a Musical for the show Merlin. Levinson passed away due to a heart attack in 1987, and Link retired shortly thereafter. A good mystery is a terrific thing. A great one, even better. The Adventures of Ellery Queen is one of the most faithful, most authentic, and most challenging mystery series ever created for television. The mysteries are fair, with clues revealed honestly along the way, so the audience can “play along” and reward themselves for their shrewd deductive skills, or learn what they should have been paying attention to if clues are missed. Mix in terrific characterizations, a wonderful period setting, and clever writing and production, and you have a series worth seeking out. Later this year, treat yourself, and find a copy of Ellery Queen on DVD. I’ve seen these wonderful mysteries, and I know who did it… will you? Aired on Friday 8/7 Central? No. Thursdays at 9/8 Central for much of its run, with a brief move to Sundays in 1976.